It’s a common thought that today’s music isn’t what it used to be. Not necessarily better or worse, just different. This past weekend, the Holiday Magic Train spread a genre of music unfamiliar to most. At 1:22 p.m., the Holiday Magic Train left the Fairview Heights MetroLink station on the Red Line with Miss Jubilee and the Humdingers on board as part of Metro’s Holiday Music Concert Series. The band’s exciting blend of authentic 1920s Hot Jazz, Swing, Rhythm & Blues and 1950s Rock n’ Roll transported me back to a time of fringe dresses, high-waisted skirts and a general upbeat feeling. While watching the musical group led by a high energy female vocalist and backed up by a horn-fueled swinging’ rhythm section, I found myself having to hold back my swinging hips and tapping toes. Who am I kidding, I did no such thing! It was impossible to sit still! 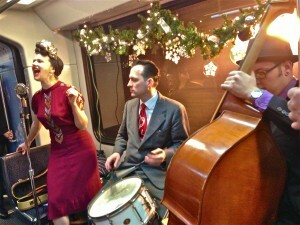 Miss Jubilee and the Humdingers had everyone on the train smiling, snapping and at many times, singing along. This week, the Holiday Music Concert Series continues at two MetroLink stations with live concert performances by local high school students. On Wednesday, December 19, the Vashon High School Wind and Percussion Troupe will perform a 30-minute concert at the Grand MetroLink Station at 4:45 p.m. in the Scott Avenue Transit Plaza. Then on Thursday at the Brentwood I-64 MetroLink Station, you can catch the Xpression group from Bayless High School from 5:30 p.m. to 6 p.m.